You probably wouldn’t be reading this blog, or this review as posted on-line, if you didn’t know what ‘spam’ is, or if you only thought it was a canned meat-like food. And if you know what spam is, you probably find it annoying — a clutter filling your email in-box — but not necessarily dangerous. You would be wrong. Brian Krebs, the cybersecurity expert who first reported the infamous security breach at Target®, is a journalist and blogger who has devoted himself to investigating and reporting on cyber security. 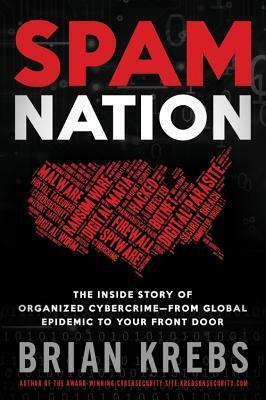 In Spam Nation, he details the rise and fall of the world’s leading spammers. Perhaps it’s not too surprising (especially to anyone who has actually read through some spam) that the leading spammers are from the Russian Federation and neighboring states. What is surprising (at least to me) is how much of the spam is fueled by so few people; how a personal feud between the top two leading spammers brought about their own downfall; and how much money these criminals actually make. For an example of the latter… Krebs reports that one leading cyber-criminal had his very expensive import car stolen and decided that because it was a vehicle that was considered to be highly valuable property he decided to by a different car (a BMW, I believe it was) rather than try to get the car returned. I can’t imagine having the kind of money where you just buy a new vehicle (and a BMW or Mercedes) instead of trying to recover a stolen vehicle. The book is incredibly interesting, but also more than a little technical. It likely wouldn’t have mass appeal because too many people may find the computer jargon difficult to follow. On top of that, because of the nature of who the criminals are, it also reads a bit like Dostoevsky with a great many East Slavic language names. Keeping them straight was often a challenge, made more difficult by the fact that they often were referred to by their on-line nicknames, which sometimes changed. Krebs, on the one hand, occasionally came across as arrogant and boastful — making sure we know how much the spammers kept an eye on him because of what he could do — but on the other hand, as we read through the book we learn that much of what he presents was gifted to him by insider sources, likely because of the feud. The presentation of material felt a bit scattered, as though Krebs had so much he wanted to share but didn’t know what to give us first. He is a good blogger and journalist, but putting information in a book-length format requires a different sort of thinking and planning. It might have been just as successful if he had simply published a collection of his blog posts. Even so, I learned some things from this book, which is often more than I can hope for from a non-fiction title. I was more thana little shocked to learn that at one point in 2013, “nearly 70 percent of all email sent daily was unsolicited bulk email relayed via spam botnets” and that the cyber-jerks sending spam were sending approximately 85 BILLION junk/spam messages every DAY. Ouch. I’ve come away with new knowledge and perhaps even a way to make myself a little better, and that’s definitely worth something. Looking for a good book? Spam Nation gives you a look inside the belly of the cyber-spamming beast, and you might not like what you see inside but the knowledge is a good thing to have.